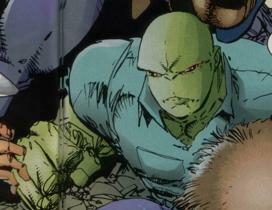 Brute was one of the many Vicious Circle members that escaped from Stronghold Penitentiary back when Dart first joined up with the Chicago Police Department. His electrical touch brought down the vigilante Star. Brute fled the scene when reinforcements arrived but wound up back in prison after OverLord dispatched him alongside a group of killers to assassinate CyberFace, held prisoner at the time within a police station. After escaping once more when CyberFace remote accessed Stronghold’s computer systems, Brute remained with the Vicious Circle from that point on. He was later selected by OverLord III to become one of the Dragon Army. Emperor Kurr was disgusted by the theft of his blood and proceeded to exterminate those that had been transformed by his blood, shooting Brute in the face using the Dragon-Slayer’s weapons.